NYK conducted a crisis-response drill based on the scenario of a serious accident occurring on an NYK-owned VLCC (very large crude-oil carrier). 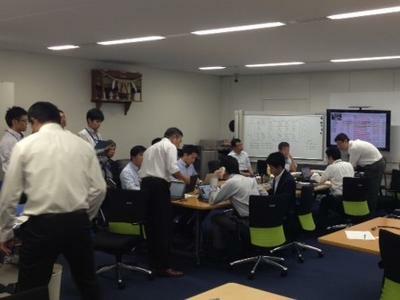 Cooperation from the Maritime Bureau within Japan’s Ministry of Land, Infrastructure, Transport and Tourism (MLIT), in addition to the Japan Coast Guard and the Maritime Disaster Prevention Center, enabled this drill to be realistic and practical. During the drill, NYK’s crisis-management headquarters simulated a press conference and timely press releases, and reconfirmed the importance of immediate and correct information disclosure to the public. A blackout occurred on a VLCC while the ship was sailing in Tokyo Bay. The VLCC then collided with another ship, causing oil to leak and resulting in a fire on the surface of the sea. 1) NYK established a crisis-management headquarters in response to an urgent report from the VLCC’s ship-management company. 2) NYK reported information about the accident to MLIT’s Maritime Bureau and the Japan Coast Guard. 3) NYK took measures at its crisis management headquarters to conduct firefighting, stop the oil leakage, and rescue the injured, seeking direction and cooperation from MLIT, the Japan Coast Guard, the Maritime Disaster Prevention Center, and related parties. 4) NYK sent out press releases as the situation progressed and responded to media inquiries. NYK president Tadaaki Naito and NYK corporate officer Kobune Goto explained the accident to the press at a press conference.